This week, the US Federal Reserve Bank decided to stop raising its policy interest rate for the rest of 2019. The Fed started hiking rates from near zero back in late 2016 on the grounds that the Long Depression (in economic growth, investment and employment in the US and in other major economies) was over. As economies reached full employment and used up excess capacity in industry, wages rises and price inflation would accelerate, so it would be necessary to curb any ‘overheating’ with higher interest rates to slow borrowing and spending. This policy of ‘normalisation’, as it is called, seemed to be justified after the Trump tax cuts were introduced in late 2017. Those measures led to a sharp rise in after-tax profits for US corporations and an apparent pick-up in US real GDP growth, reaching a 3% yoy rate at the end of 2018. All looked well. However, as I argued back in spring 2018, the global economy had actually peaked. And now nearly one year later, forecasts for a continued ‘recovery’ have been reversed. A year ago, the Fed had raised its real GDP growth forecast for the whole of 2018 to 2.7% and 2.4% for 2019. Now at its March 2019 meeting, it has lowered its forecast for 2019 to 2.1% and just 1.9% for 2020, slowing again to just 1.8% in 2021 – well below the boasted 3%-plus that Trump claims his tax measures would achieve permanently. So now the Fed is stopping its rate hiking and also ending its monetary tightening policy of running down its huge holdings of government bonds that it had built up as part of the ‘quantitative easing’ programme, launched in the Great Recession to save the banks and provide cheap money for investment. What is happening? Well, it always was a risk that hiking interest rates when economic growth and investment were weak would cause a stock market collapse and a new economic slump. Now with US economic growth in the current quarter to the end of March likely to be no more than at a 1.5% annual rate and the Eurozone, the UK and Japan slipping back towards outright recession, the Fed has taken fright and put its normalisation policy into cold storage. So the Long Depression is not over after all. 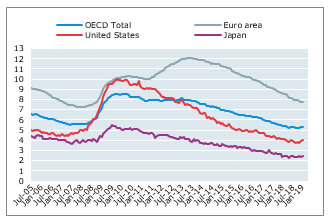 The most startling difference, however, between the Long Depression and the Great Depression of the 1930s is that, in the last decade in the major economies, the official unemployment rate has dropped back to near record lows (in the US, UK, Japan). And yet inflation has not spiralled upwards at all. 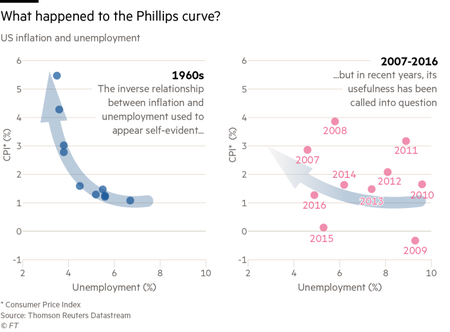 The trade-off between low unemployment and high inflation (as shown by the so-called Phillips curve), is a hallmark prediction of Keynesian aggregate demand theory. But it has not materialised. The Phillips curve (ratio of the unemployment rate to the inflation rate) is nearly flat in most capitalist economies – there is little trade-off. This is confounding mainstream economic thought and the policies of central banks, as I outlined in my previous post. “I don’t feel we have convincingly achieved our 2% mandate in a symmetrical way,” said Fed chair Jay Powell. “It’s one of the major challenges of our time, to have downward pressure on inflation”. What seems to have happened is that, in the wake of the Great Recession, in an environment of low profitability on capital in most major economies, companies have opted to take on more labour rather than invest. The new labour entrants are being employed in low-wage occupations, and/or on temporary and part-time contracts. 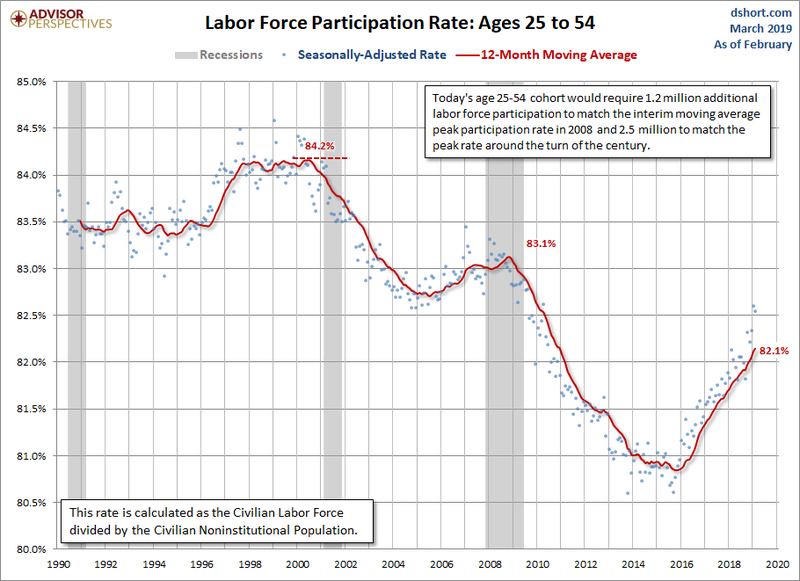 For example, there are 17% of American workers only employed part-time, one-third more than in the 1960s. The US official unemployment rate may be down but that is partly because many Americans of working age have disappeared from the labour market: to study, work informally or just live at home with the family. And there has been a rise in self-employment – in the so-called ‘gig economy’. 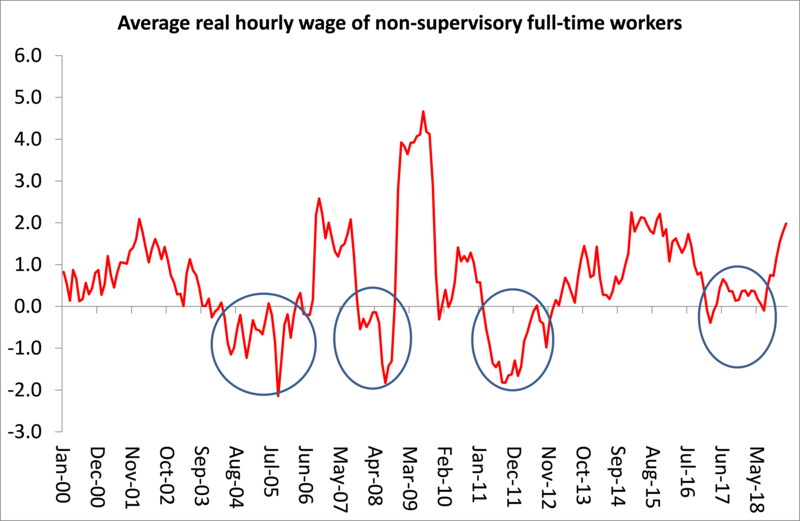 So, while skilled workers (in short supply) have begun to experience wage rises, the bulk of the non-management workforce in the US, the UK, Japan and Europe instead have seen significant periods of falling real earnings. While the average real GDP growth rate per person in the US has been about 1.5% since 2009, average hourly real earnings for most US workers have risen only 0.8% a year. Thus there has been no ‘wage-push’ inflation and average real incomes have stagnated. The capitalist sector has not increased investment in new machinery, plant or technology to a level that would lead to replacing labour or boosting the productivity of the existing workforce. Whereas in the Great Depression of the 1930s, unemployment remained high up to the start of WW2 while productivity rose sharply; the opposite is the case in this Long Depression. 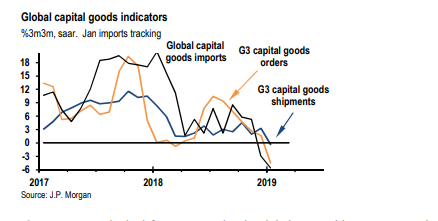 The latest estimate of global capital investment made by JP Morgan economists suggests that investment orders are falling and imports of capital goods have moved into negative territory. In contrast, the US stock market heads back to new highs. We are now in an economic world where there appears to be a sort of ‘full employment’, but stagnant real wages (for most), low interest rates and inflation and above all low productive investment. Meanwhile corporate debt is rising fast globally as major companies issue bonds at low rates of interest in order to buy back their own shares and thus boost the company’s stock price and continue the party. The Long Depression has become a fantasy world of rising financial asset prices, low investment and productivity growth, where nearly everybody can get a job (working part-time, temporary or self-employed), but not a living. This entry was posted on March 22, 2019 at 8:01 am and is filed under capitalism, economics, Profitability. You can follow any responses to this entry through the RSS 2.0 feed. You can leave a response, or trackback from your own site. The Fed is not putting rate hikes on hold because of a slowing economy, but, because speculators were screaming about rate hikes causing a 20% sell off in USW equity markets last year. It is simply a return of the Greenspan Put. The slowdown in the US economy is a direct result of Trump’s global trade war, and the imposition of swingeing tariffs. The same cause last year, is estimated to have knocked about 0.3% off Chinese GDP. In one month last year, Chinese imports of US soyabeans dropped to zero in response to US tariffs on Chinese exports to the US. Yet, the US job numbers continue to rise, which with a growing need for the US to spend on infrastructure, alongside Trump’s tax giveaways, creating a ballooning budget deficit that will have to be fiannced by borrowing, alongside a ballooning trade deficit, despite the tariffs, which will also have to be financed by borrowing, at a time when China is reducing its purchases of US debt, and may begin to sell some of it, means that the US is heading for a 1987 style Twin Deficits Crisis, and means that whatever the Federal Reserve might want to achieve via lower official rates, real interest rates in the global economy are going to be headed higher. A similar pattern can be seen in Europe, with the effect of Trump’s trade war on China also having a secondary effect to his imposition of tariffs on EU steel, aluminium and proposals for tariffs on cars etc. That is in addition to the effects of Brexit in holding back investment. The global trade war is raising the cost of production, and introducing frictions in trade, but as with the prospective EU-China trade deal, it is likely to see a simple reconfiguration of trade and investment flows rather than a longer term reduction in investment and economic activity. The pressure arising from that is likely to result in Trump’s Trade War policy collapsing, with a consequent surge in economic activity, as the pent up investment spending is released. You can’t tell me that the Fed would sacrifice its independence because of a few hedge funds threatening implosion. Michael has this right. So why not give up on calling it “the Long Depression”? to understand why it differs from the classic pattern of The Capitalist Cycle from the nineteenth century. A good start would be reviewing the stylized facts of the classic cycle and examining the commonalities and differences with the post WWII cycle. Dogged repetition.of misleading descriptive labels is no substitute for serious theoretical work. “Well, it always was a risk that hiking interest rates when economic growth and investment were weak would cause a stock market collapse and a new economic slump”. But the ECB and the Bank of Japan did not raise their rates and are in worse shape than the US or as pointed out slipping back towards outright recession. Shouldn’t they be doing better? After all their nominal rates are negative and zero. “Whereas in the Great Depression of the 1930s, unemployment remained high up to the start of WW2 while productivity rose sharply; the opposite is the case in this Long Depression.” Factually inaccurate, unemployment rate dropped from 25% to 9.6% between 1933 and 1937; see the article by Marshall Auerback “The Real Lesson of the Great Depression: Fiscal Policy Works”. A quote: “The reasons for the discrepancies in the unemployment data that have historically arisen out of the New Deal are that the current sampling method of estimation for unemployment by the BLS was not developed until 1940 (for more detail see here). If these workfare Americans are considered to be unemployed, the Roosevelt administration reduced unemployment from 25 per cent in 1933 to 9.6% per cent in 1936, up to 13 per cent in 1938 (due largely to a reversal of the fiscal activism which had characterized FDR’s first term in office), back to less than 1 per cent by the time the U.S. was plunged into the Second World War at the end of 1941.” See here: http://rooseveltinstitute.org/real-lesson-great-depression-fiscal-policy-works/ — The next paragraph is worth quoting: “In fact, once the Great Depression hit bottom in early 1933, the US economy embarked on four years of expansion that constituted the biggest cyclical boom in U.S. economic history. For four years, real GDP grew at a 12% rate and nominal GDP grew at a 14% rate. There was another shorter and shallower depression in 1937 largely caused by renewed fiscal tightening (and higher Federal Reserve margin requirements).